“This protocol is a very important step in the right direction, in the direction of strengthening the effectiveness of the legal aid system”. That’s how Pietro Sardaro, EUAM’s Regional Outreach Prosecution and Judicial Reform Adviser, speaking this morning at a high-profile public round table in Poltava on “Free Legal Aid: for the defence of citizens’ rights”. 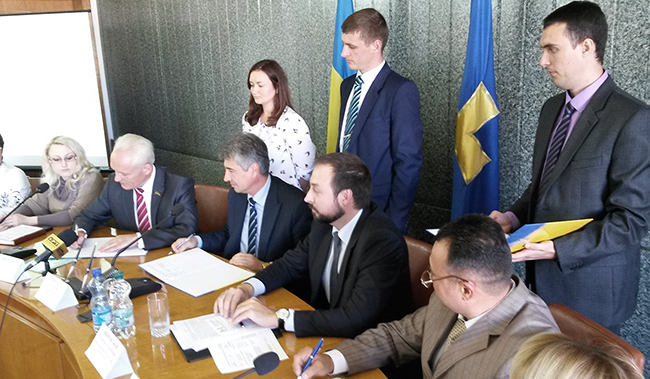 Its focal point was precisely the signature of a “memorandum of cooperation” by Oleg Pruglo, Deputy Head of the Regional State Administration, Volodymyr Marchenko, First Deputy of the Regional Council and Andriy Vyshnevskyi, Director of Coordination centre on providing Free Legal Aid. The agreement meaningfully aims at fostering “the development of the system of the first legal aid and establishment of equal opportunities for access to justice for individuals by providing secondary legal aid”, as well as supporting “the activities of the Regional and local FLA centres”. A priority is set on “the aim of preventing human rights violations” and on the methods of an open, transparent communication, both among State and regional institutions, and with NGOs. “The parties strive for cooperation with civil society organizations in the area of providing legal services”, the protocol underlines. “The challenge is to make sure that the backbone of the legal aid service proves to be up to the job, that it provides a high quality, timely service to those in need; and in order to do so, it is crucial to manifest your presence, make yourself visible”, echoed Mr. Sardaro, with a further, eager wish: that “cooperation will follow, with representative of civil society for example, but also, even more crucially, with law-enforcement authorities and with the prosecution”. In fact, representatives of law enforcement agencies also participated at the event.